Okay ... when I put on the "outfit" I look more like a homeless man/rodeo clown/Jerry Garcia clone. My wig never fit right and one side was always bigger than the other. The moustache got so gummed up with adhesive that my lips stuck together and the accent that I used to speak was a mixture of Yiddish and English and Puerto Rican at times. 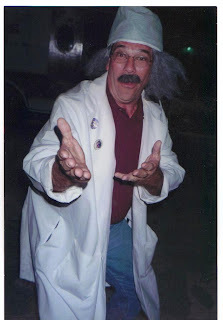 But ... still ... Dr. Pete E. Atric, the character I created at All Children's Hospital many moons ago, is still in my blood. Originally, he was meant to introduce the music that Mike Sexton and I produced (http://www.bodytoonups.com/). Dr. Pete was the face of the program (God help us!). 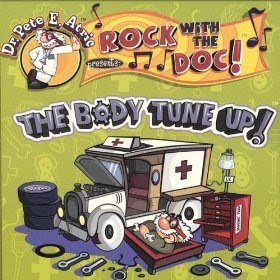 He was the kindly old doctor that was part mad scientist and part family doctor ... introducing kids to the world of medicine and health care. The cartoon version of Dr. Pete is much cuter of course and doesn't scare the kids half as much as that Momberg guy. For many years, you would see Dr. Pete's face (the cute one) throughout the hospital, on the telethon and throughout the community. He became the unofficial mascot of All Children's. One year ... the folks who produced The Children's Miracle Network Telethon offered to buy the rights to Dr. Pete and use him as the national telethon spokesperson. We, of course, politely declined ... telling them that he was a "local boy". Well ... years later ... old Dr. Pete has been put out to pasture. It was bound to happen eventually. I am now at the University of South Florida embarking on new frontiers, there is a brand new $400 million hospital that has taken the place of the older one and cartoons no longer adorn the walls. My old friend Pete is still hanging in there in song and (hopefully) memories. This year we might just dust off the old play and Dr. Pete may be back ... for a special guest appearance! Way to go Dr Pete!